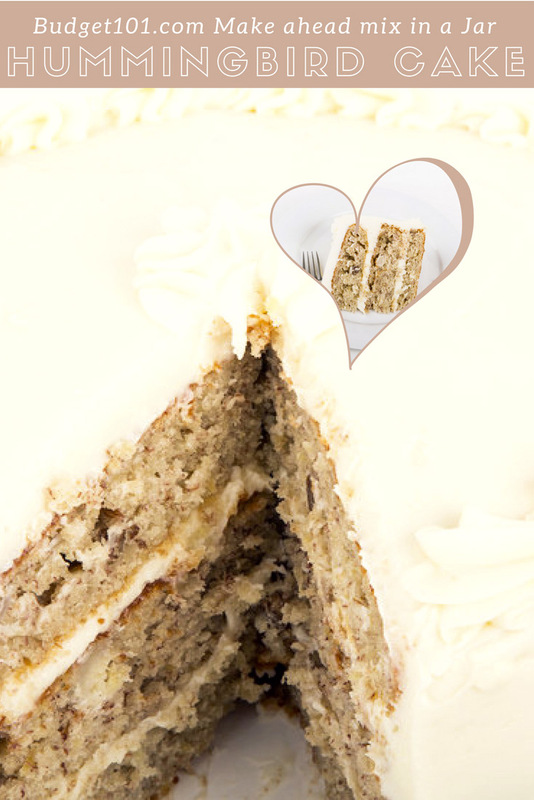 Hummingbird Cake mix is a delicious recipe incorporating pineapple, bananas and cinnamon for a rich, tropical dessert. It’s speculated that the Hummingbird cake got its name due to its sweetness, but it actually originated in Jamaica and was known as “doctor bird cake”. Doctor bird is the nickname of the Red-billed steamertail (a member of the hummingbird family) and the National Bird of Jamaica. It was likely a marketing ploy as the Jamaican Tourism board distributed recipes in the Kingston Daily Gleaner, where this recipe first appeared on March 29, 1969. This recipe has been scaled down to make a fantastic cake mix in a jar recipe for gift giving. Combine 1 package of Hummingbird cake mix, vegetable oil, and eggs in a large mixing bowl, do NOT beat. Stir just until moistened. Add the crushed pineapple, mashed bananas and vanilla extract, mixing lightly. Combine all the ingredients in a large mixing bowl, mixing until incorporated. Transfer to a greased baking pan and bake 28-32 minutes. Let the layers cool at least half an hour before frosting. Beat cream cheese and butter together until smooth, add vanilla extract and powdered sugar a little at a time until fully incorporated, whip until light and fluffy, about 3 minutes total! can’t wait to try this. any ideas for frosting ??? hummingbird cake is my all-time favorite! i love this gift jar idea. however, i am disappointed that it doesn’t have instructions for the cream cheese icing which is the best part.